My first powder purchases came in a compact form. A choice motivated by the awareness of my own clumsiness — that was more severe, back then — resulting in a powder-coated desk. And floor. This practical thought, was later developed by a new motivation: an improvement on my skills. I had noticed that the pros preferred loose powders and, through my infinite research on the web, I found that it provided a better result. I'm not one to powder the whole face. Just a dab on the nose and, sometimes, I set the concealer using the remaining product on the brush. Powders do neutralize the shine, which is great, but due to this quality, some of them might become more detectable on the skin. Not so great. 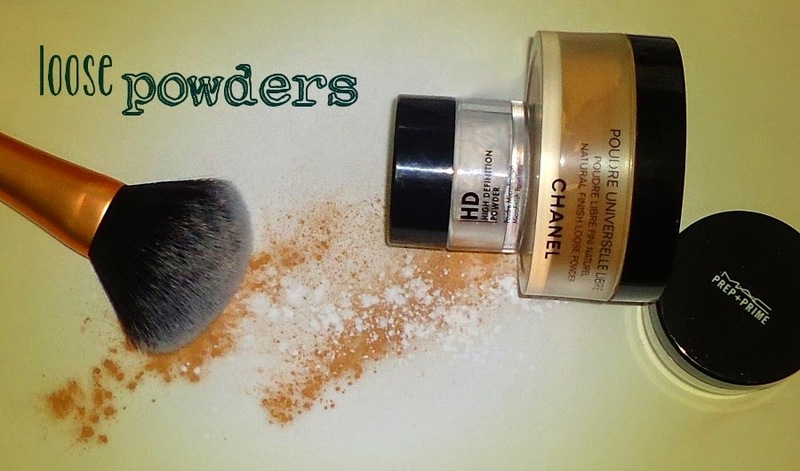 The first loose powder I played with was Make Up For Ever HD Powder. It is very, very fine — a sweep with the brush results in a cloud of white dust in the air — and transparent to the naked eye or in filming. Apparently, not so great with flash photography, it might result in a white cast (see Wayne's video, here). Nonetheless, it makes the skin look pretty much flawless and unbelievably soft to the touch, as it's made of silica powder. Comes in one universal shade that suits all, but do apply sparingly. Being a great setting and mattifying tool, the HD Powder also enhances dry patches. So, when the priority is to set the concealer on a dry under eye area, this might not be the best offering. Another product of sorts, it's the MAC Prep+Prime Transparent Finishing Powder. Again, one universal shade that suits all and, even though the particles are less fine — no cloud formation — I find this one more transparent. A great one for T-zone duties, since it perfects the look of pores and controls shine. After sitting in my mental list for quite some time, Chanel Natural Finish Loose Powder entered my collection, by surprise, on account of an impulsive buy. It actually does provide a natural finish and it is, by far, the best to set the under eye area or to use on dry skin types. Whilst being transparent, it does unify the complexion, allowing the use on bare skin. And, controls shine without a dull appearance. My recommending finger points immediately to this one.